The desire to find a way to prevent future flooding comes in the face of a warming world, and continually rising seas around Greater Boston. A year after Boston’s Aquarium Station flooded during a historic high tide in the city, the Massachusetts Bay Transportation Authority is testing a new way to prevent future floods. 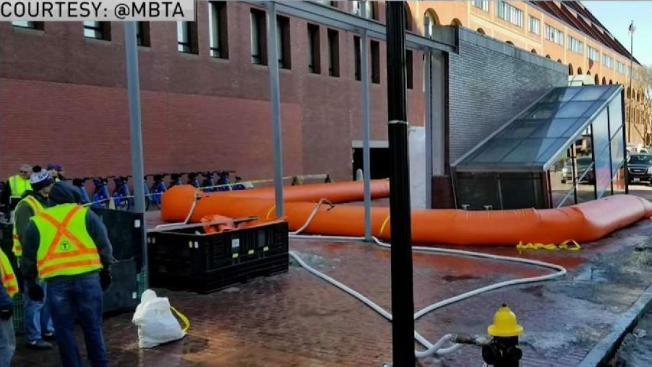 Transit officials conducted a training session this weekend at the Blue Line station, inflating giant ‘Tiger Dams’ around the Long Wharf entrance. According to the manufacturer, these ‘Tiger Dams’ can be filled with water, from a hose or a fire hydrant, in minutes. They are designed to replace sand bags, and can be stacked on top of each other. In 2018, during the record breaking 15.16 foot high tide in Boston, the station was closed for a time as sea water cascaded into the subway.